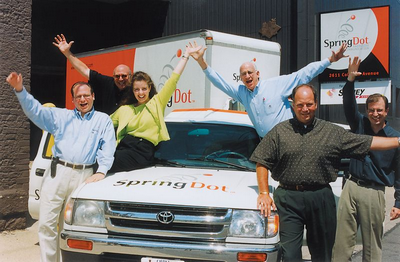 On Saturday, August 24, 2004, SpringDot® celebrated its 100th anniversary – a milestone that few family-owned businesses have the privilege to achieve. 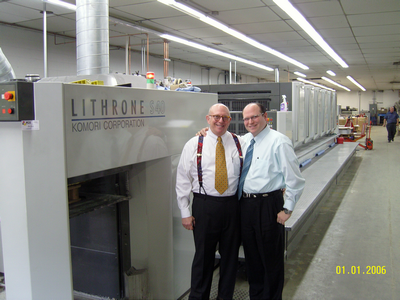 The business has transitioned through four generations of the Deutsch family and has grown from a one-hand operated press on a street corner to multiple automated presses that can print up to 15,000 sheets per hour. 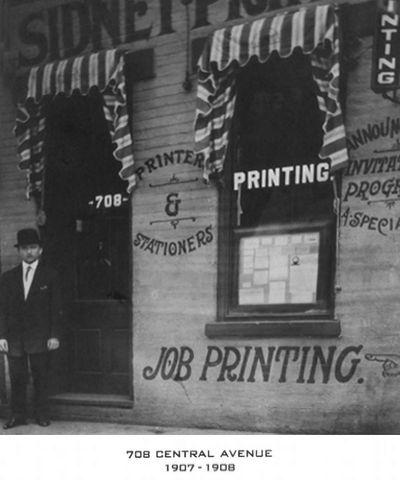 SpringDot® (formerly Sidney Printing Works) was founded by Sidney Deutsch, an eighteen year old Hungarian immigrant who entered America through Ellis Island in the early part of the 20th century. 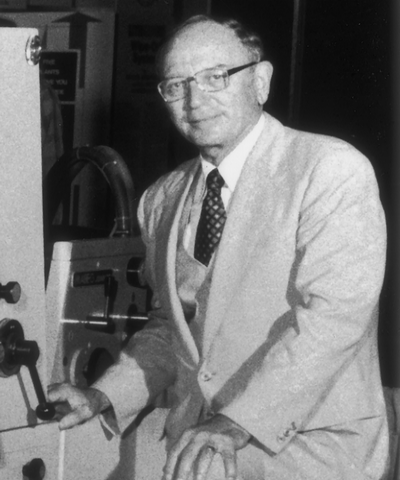 In August 1904, Mr. Deutsch – grandfather to Jeff and Thom Deutsch and great grandfather of current CEO Josh Deutsch – bought his first printing press. Sidney was sanding pianos at Baldwin Piano and had to leave his job since he came down with blood poisoning. At that time he shared rooms with someone that needed to move to Arizona for his health. 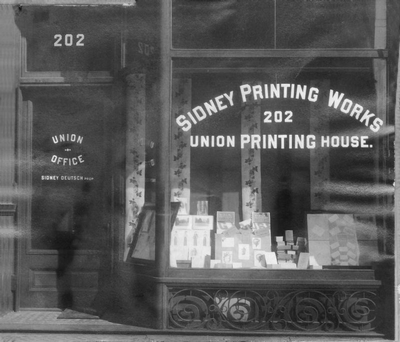 His roommate had a small hand operated printing press and Sidney bought it and started Sidney Printing Works. The company (the kid, Sidney) would print calling cards for those who came up to him on the street. You would have to write out your name and address since he did not speak English at that time. He set the type and printed you 100 first class cards. As the business grew he added a bookkeeper, his wife Sarah. 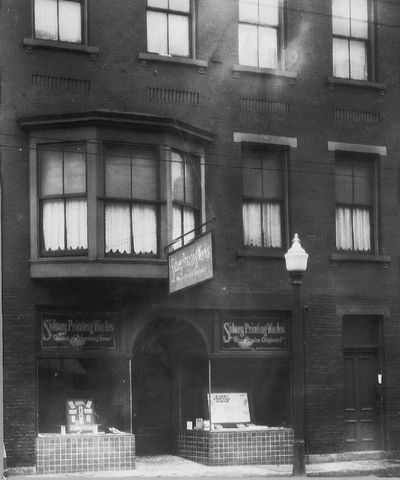 In 1908, they moved into a larger shop from the first location, which is where the Crew Tower now stands in downtown Cincinnati. 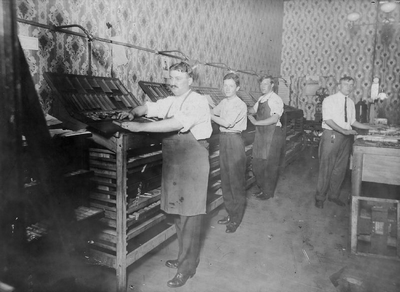 They took with them the hand press and an established clientele: customers who had been impressed with the quality of work from “that kid Sidney” and who were now hopeful of continued quality from his new shop “Sidney Printing Works”. Over the next five decades he became a citizen, married and had a family, went through two world wars and a significant depression while building his business. 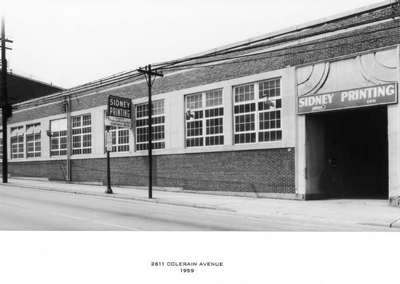 At the end of WWII, Sidney’s sons, Frank and Howard, returned from serving their country and took over the business. Frank was sales and Howard ran production. 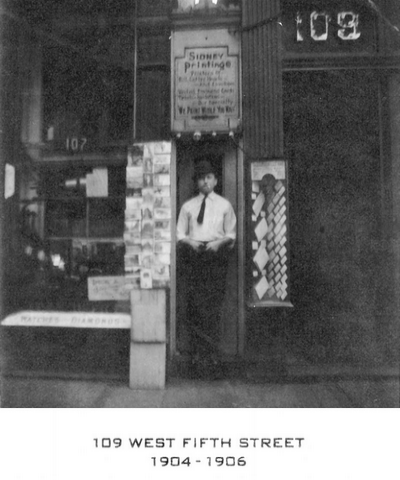 It was a simple business located on West 7th Street then and when they retired in the 1970’s. 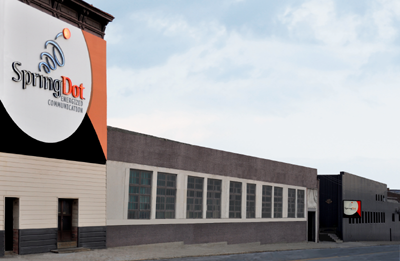 It had grown to 4 buildings in Camp Washington providing commercial print to clients ranging from Playhouse in the Park to Procter and Gamble. 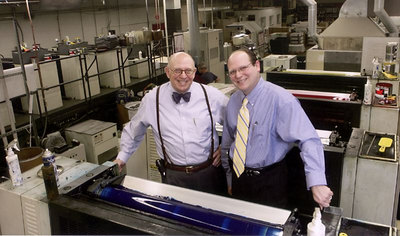 Jeff Deutsch took over the role of President in 1974 and moved the company into four-color print while broadening the sales base. 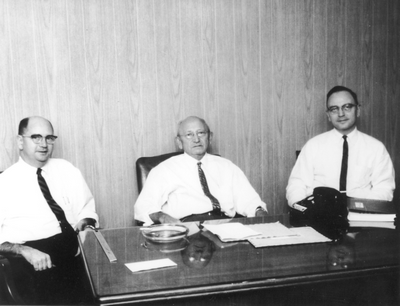 His brother Thom followed in that role in 1985 providing structure to what was becoming more than a small business. 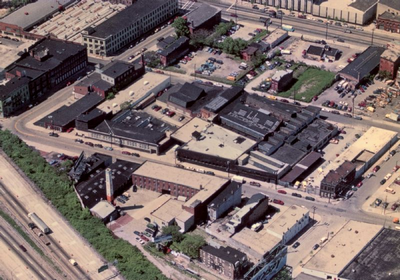 The business now covered seven buildings pumping out print that touched a large percent of the regional population and reach out nationally as well. In keeping with the family tradition, the fourth generation Josh and Ryan Deutsch joined the company in the late 1990s. They brought internet and multimedia services to the company. Ryan Deutsch went on to Chicago and currently is a Division VP at Sears. 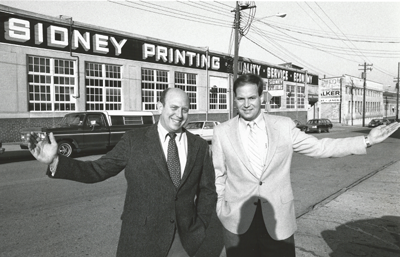 In the year 2000, the employees and family at Sidney Printing decided it was time to change the name of the company to reflect the evolving business model and changes that were occurring around the world. 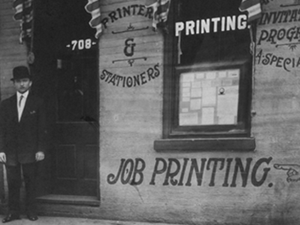 The business was offering a broader range of services on different platforms and the name "Sidney Printing" did not reflect the direction in which the company was moving.  SpringDot – Energized Communication™ was born. In late 2003, Jeff’s son, Josh Deutsch, moved to leadership in 2002 and has provided the leadership that has grown this family business and more than doubled its sales in the last 10 years. Josh continues to lead the company which now consists of 80,000 square feet of manufacturing and fulfillment space. It has been many years since a young man from Hungary, Sidney Deutsch, began his first printing business. The company now occupies seven structures. 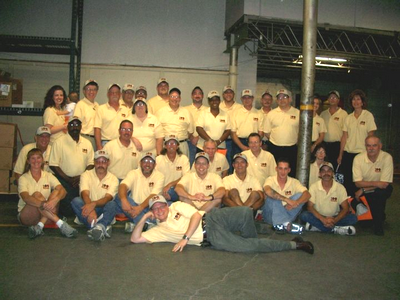 The one-man staff has grown many-fold and includes a creative department, pre-press, print, a full bindery, and Fulfillment Center, but our most important asset is our staff of skilled employees. 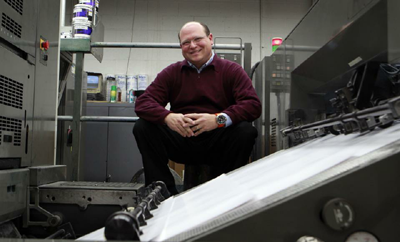 The hand-operated press has given way to automated presses that can print up to 15,000 sheets per hour. "Never say no. Always have empathy for the customer. Feel their need, feel their passion. Deliver a great product every time. Be fair, and always be honest."